Our range of fascias and soffits are a fantastic upgrade to the look of your home. They are one of the most durable and long lasting products on the market today. Manufactured from the highest quality Extruded UPVC, our fascias and soffits are resistant to extreme weather conditions and temperature fluctuations. With a UV Resistant finish ensuring no discolouration, our fascias and soffits come complete with a 10 year guarantee. Our fascias are availalable as a capping to cover solid existing wooden fascias or a full replacement facia, which fixes directly to your roof joists. Our soffits come in either a plain board or a vented if required. We stock a wide range of accessories to compliment our fascia and soffits range. Our guttering is also manufactured from the highest quality UPVC to ensure the greatest resistance to extreme weather and to eliminate discolouration. Manufactured with a high gloss finish, our guttering is available in White, Brown or Black with profiles in Round, Square and Ogee. Our range of external cladding is one of the best developed systems on the market to date. Manufactured from high quality UPVC, this system comes with a 10 year guarantee and is resistant to extreme temperature and climate variations. External cladding is available in a wide range of colours and effects, from brilliant white to wood effects including woodgrain, light oak and rosewood. A range of trims are available in matching colours and effects. 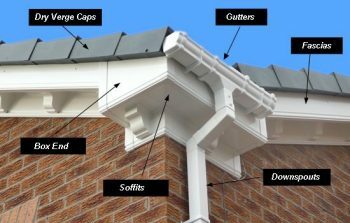 A wide range of ancillary products are available to suit our fascias and soffits, guttering and external cladding range. This range includes plastic headed pins, screws, pvc cleaners, adhesives, expanding foam and double sided tapes. Please call our sales team on 028 276 65920 or email sales@mcilhatton.co.uk for further information.